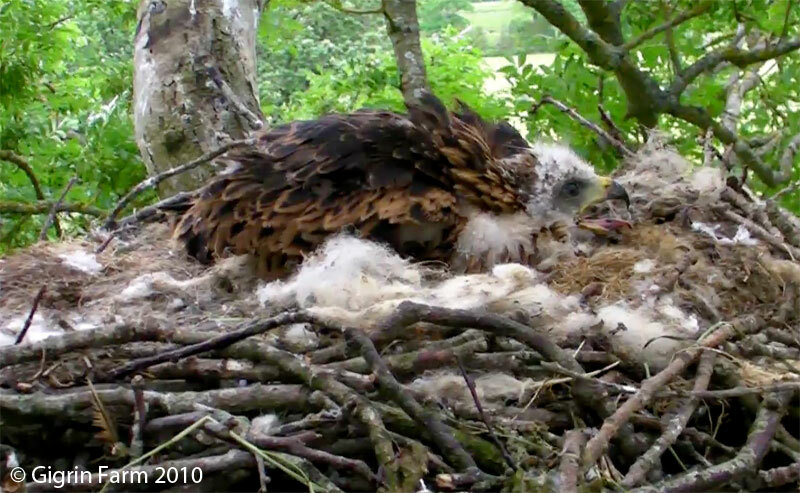 The image on the left is from a red kite nest, complete with chick, at about 80ft above the ground. Robert Straughan, of Northern Ireland RSPB, very kindly took my HD video camera up into the canopy and took some amazing footage. I'm currently trying to compress video for the web and will post links as soon as I have something usable (mbs rather than gbs!) This last week another 24 red kite chicks were brought back to Gigrin aviaries. Having had their inspection by a DEFRA vet on Saturday evening, they left for Southern Ireland yesterday morning. The number of kites visiting the feeding station has gone up dramatically..Food is scarce during the heatwave. But for resizing for the web, these pictures have not been manipulated in any way.. 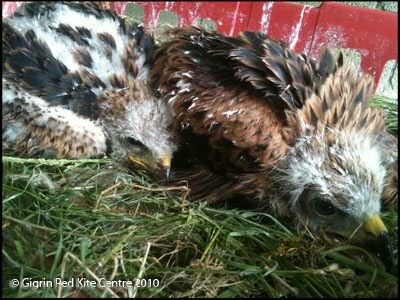 The wings look deformed due to the way the kites feathers are compressed as it dives in at speed. Capturing the moment that the talons grasp the meat is my next goal. With a westerly breeze and sunshine again forecast today it should be perfect for both filming and photographing these beautiful creatures. While seeing the numbers coming in at 3pm is a wonderful spectacle, the better photographic opportunities come later in the day when individual kites become much easier to track. Red Kite Chicks have once again been staying at Gigrin before heading out for the Irish Republic and Northern Ireland. The 29 went out last week - 14 to County Whitlow, courtesy of the Golden Eagle Trust in the I.Republic, and 15 to N.Ireland - courtesy of the RSPB. We've been having rather fraught times at Gigrin these past weeks what with not 1 but 2 of my hard drives going bad, so I've had enough practice in re-installing programs etc, hence the lack of news on this blog. Our springs are no longer producing as they used to so we have had to take the plunge and have a borehole put in. Unlike the headaches of past few years, this should now ensure that we don't again run out of water. In the Rehabilitation aviaries we currently have 1 buzzard (still awaiting its molt), 2 adult red kites and one red kite chick . 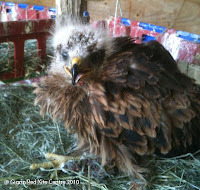 The chick is having antibiotics each day due to an injury to its right leg. This is administered via injection to the muscle. 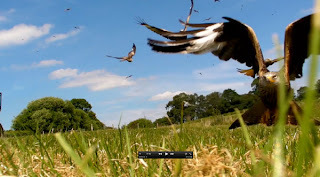 One of the adult red kites is also on the same medication and is very feisty as each time it sees me it feels a needle in its leg. This bird has had its moment - with its good leg, the steely grip of talons encompassed my right hand and drew blood as they increased their grip without remorse. It's no easy matter to extract ones hand as the other is holding the beak and the other set of talons at bay. Its good that the aviaries are well out of earshot of the public areas as the air turned blue with the pain. 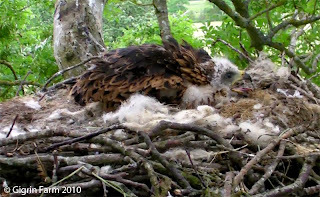 The chick (left) is recovering well. It had wool wound tightly around its leg and this had caused swelling to the extent that the limb was unusable but the course of antibiotics is doing the trick. There will be more news within the week - Promise!